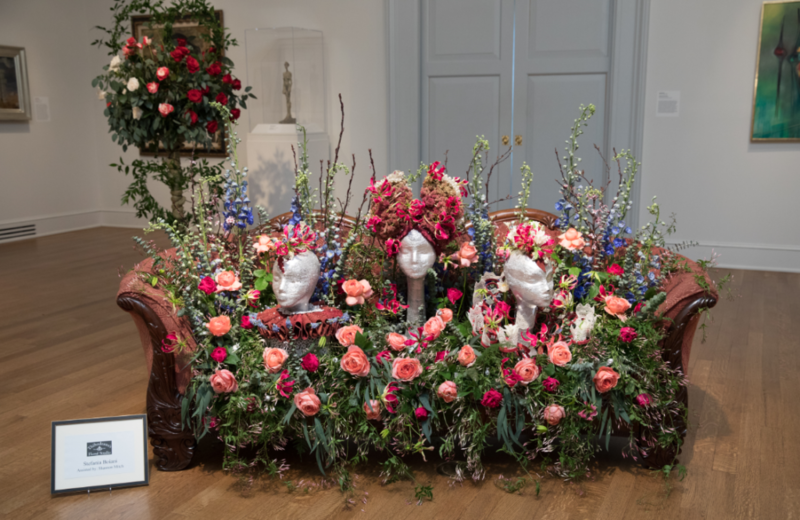 NEW ORLEANS (press release) – With a focus on light, transformation and discovery, the theme of Art in Bloom 2019 at the New Orleans Museum of Art (NOMA) is "Illuminations: Looking Within and Beyond." This highly anticipated springtime event takes place March 27-31. After an extraordinary Tricentennial year of reflection and celebration, 2019 presents the opportunity to look ahead with limitless imagination and innovation. "Illuminations: Looking Within and Beyond" is in partnership with IBERIABANK. Floral arrangements on view in Illuminations will echo NOMA’s special exhibition "Keith Sonnier: Until Today." The first comprehensive museum survey for conceptual artist Keith Sonnier, Until Today presents the artist’s illustrious works in neon, as well as rarely exhibited works in sound, satin, radio waves, and bamboo that demonstrate Sonnier’s interest in the way architecture, light and form commingle to shape human experience, communication and interconnection. In collaboration with The Garden Study Club, this five-day event showcases more than 75 exhibitors of spectacular floral designs. Proceeds benefit educational projects and exhibitions at NOMA, and community projects of the Garden Study Club of New Orleans. Recipients of Garden Study Club grants include the New Orleans Botanical Garden, Long Vue House and Gardens, the historic parterre garden at the Beauregard-Keyes House, rain gardens at City Park, and the Sydney and Walda Besthoff Sculpture Garden. The annual Art in Bloom Patron Party and the subsequent Preview Party will be held Wednesday, March 27. With cuisine and libations from more than 25 top New Orleans restaurants and caterers, guests can enjoy an exclusive preview of the floral displays at the premier social event of the season. featured auction item this year is a video installation by New Orleans artist Courtney Egan, whose work has been featured in the NOMA exhibitions "Pride of Place: The Making of Contemporary Art in New Orleans" and "Ear to the Ground: Earth and Element in Contemporary Art." The popular Art in Bloom lecture series and the annual Art in Bloom luncheon and fashion show are scheduled for the following day, Thursday, March 28. Lecturers are professional florists Putnam & Putnam and interior designer Nicky Haslam. Founded in 2014 by Darroch Putnam, a photographer by trade, and Michael Putnam, a formally trained interior designer, the Putnams’ signature floral designs meld site-specific drama with gentle precision, garnering the attention of high-profile clients including Bergdorf Goodman, Vogue, Harper’s Bazaar, and Gwyneth Paltrow. Most recently, they have authored The Flower Color Guide, the first reference book to organize flower types by color. The Putnams will be speaking about their design philosophy while presenting a hands-on floral demonstration. Nicky Haslam is one of the world’s most distinguished and prolifically published interior designers, renowned for opulent, original and timeless interiors around the world. As seen in Architectural Digest, World of Interiors, Vogue, House and Garden, Elle Décor, and Traditional Home, his projects combine a unique sense of history with a modern, contemporary outlook. A legendary raconteur, Nicky will be sharing his wide-ranging perspective on interior design and the garden. A luncheon and fashion show presented by Saks Fifth Avenue will take place in the Pavilion of the Two Sisters in City Park following the lectures.